8309 Parliament Circle, East Amherst, NY.| MLS# B1150075 | Largest Real Estate Sales and Property Management Company in The Finger Lakes and WNY. 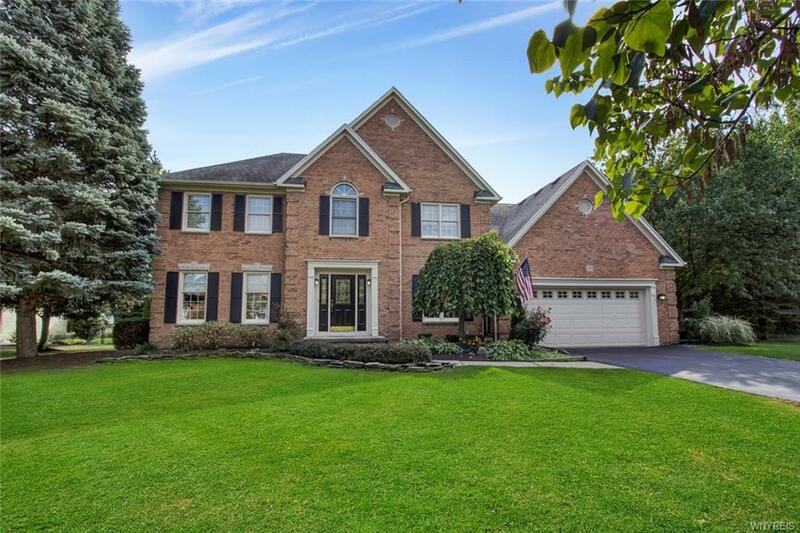 Gorgeous Colonial in beautiful Manchester Park community on a private cul-de-sac! Fabulous floor plan, this home has been completely renovated! Home features bright 2-story foyer w/stunning wrought iron spindle staircase & hardwood flrs. Stunning kitchen w/hrdwd, high-end prof appliances, island, custom cabinetry & granite countertops overlooks FR w/gas fplc & vaulted ceiling. Spacious formal DR & LR. Private office w/dbl french drs. Master en-suite has gorgeous glamour bath. 2nd flr has 3 add'l great size bdrms & remodeled bath. Updated neutral paint colors and neutral carpeting thru-out. Private yard professionally landscaped, deck w/decorative stamped patio & oversized custom brick front shed. Furnace '12, A/C '16, Roof '10. Williamsville Schools! You don't want to miss this one! !